Fishing has been good for deep trollers and fly fishing in the streams and the mountain rivers has still been good. Bait fishing has varied but there are still some good fish with a few mudeyes poking around. Was up at Thredbo river on Saturday morning and got onto this nice brown around the Thredbo Diggings area. 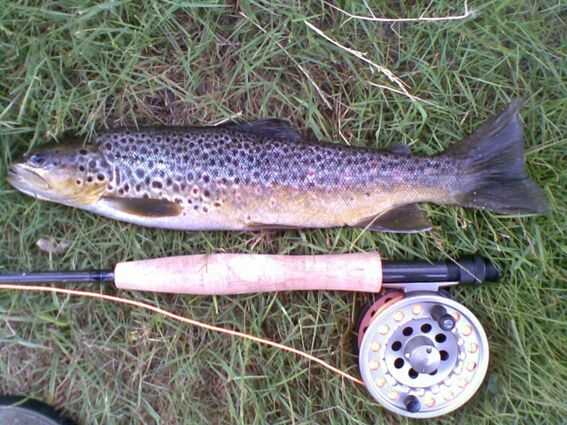 This was the first and the largest of three browns with the others just under 35cm. All caught between 8am & 10am on olive bead headed nymphs and a yellow humpy. Myriads of smaller streams that have been fishing well of late and certainly dries have been very effective. Light rods, light tippets and small flies are the go for some good fun in these waters. Lake Eucumbene:- Fly reports have been varied this past week with the warmer surface temps causing the fish to go deep. Having said that there have been a few fish taken on hoppers but not many. Some of the hatches of midge and caddis have been huge in the evenings but very few if any fish have been moving. We need several days of cooler weather and rain to fix the lake up. Areas with deep water have been the still producing a few fish down deep and late at night or early morning will be the best times over the weekend. 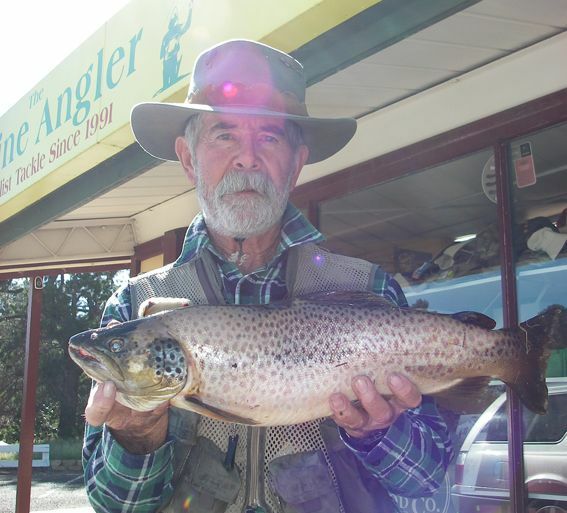 *Charles Sealy from Tumut had a nice session on Tuesday night in the Old Adaminaby area catching a 2.22kg brown and a nice rainbow. Fishing the strirred up water where it met the clear was the best area and a Taihape Tickler was the fly used. Just a quick email to let you know myself and my partner Lindsey Evans fished <?xml:namespace prefix = st1 ns = "urn:schemas-microsoft-com:office:smarttags" />Lake Eucumbene the week leading up to Xmas and were lucky enough in a quick morning session to get the fish attached in the photos. All taken on yellow wing devils out on lead line with 2 colours in Wanglabelle Bay. This brown trout was Lindseys first trout and was 1.5kg, not a bad first effort! *Mick and Meg Couvee had a late start on the lake this morning but still managed to hook four fish. Meg landed two rainbows of .7 and 1.5kg. Bloody ripper tassies and white with spots Loftys caught the fish, with one lure fished on leadcore the other flatlined. Mick had a busy day as he drove the boat, changed the lures, cooked the lunch and played net boy. 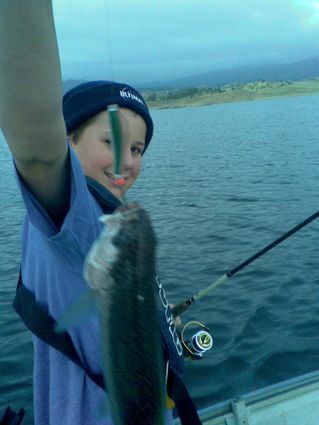 Zac James, one happy kid after a Sunday morning troll from snowline jindabyne with 8 fish landed all rainbows, 7 were released for next time, 3 on downrigger 8-11 meters, and lead line 3-6 colors, tassies ranging from freddo frog to brown bomber and the green and red working well. Took the boat and family out fishing on lake jindabyne on Sunday 17th Jan. Caught 2, 1kg rainbows lost 1 at the boat and had three hits all on the one rod, a small overhead with lead core line at 10 metres.most of the fish were at 10 to 20 metres according to the fish finder. Mudeyes have come into their own recently and supply is excellent this week.